My grill broke last summer. We were in the middle of a move, and I still held onto the hope that we could fix it, so it wasn’t replaced. In Southern California, grillin’ isn’t just a summer activity, it’s a year long love affair, making an entire 13 months sans grill a really long time to deprive myself of the chard glory of fire cooked food. We just replaced it this past weekend and I can’t get enough of it. I had been trying to satisfy my urge to grill via my grill pan. Although it is a pretty fantastic pan, after making this corn on my stove top in a grill pan I couldn’t take it anymore, I had to have the real thing. I think I’ve officially reached Grill Junky status, lets hope I can keep it under control. Hope you don’t mind too much, but I’ll be posting my grilling adventures over the next few weeks. And probably well into fall. My favorite pinterest board right now is my Grillin’ like a Villain. Feel free to post links to grilled food I should be aware of! Slice the artichokes down the center, lengthwise. Using a melon baller and a paring knife remove the hair from the choke as well as the inner purple leaves, leaving a cavity in the center of the each artichoke half. Boil in the pot of lightly salted boiling water until the outer leaves tear away easily, about 20 minutes. Grill the pineapple rings until strong grill marks appear on each side, about 3 minutes per side. Remove form grill, allow to cool slightly, chop. In a small bowl stir together the crab meat, pineapple, sour cream, hot pepper sauce, ½ tsp each of salt, pepper, chili powder, and mustard powder. Using a cheese crater, grate the Brussels sprouts, this should equal about 2/3 cup. Stir the grated Brussels sprouts into the crab mixture. Once the artichokes are done cooking, remove from water and allow to drain. Mix the melted butter, lemon juice, salt and pepper together in a small bowl. Brush artichokes on all sides with melted butter mixture. Brush the grill with vegetable oil. Grill artichokes, cut side down, until nice grill marks appear, about 5-8 minutes. 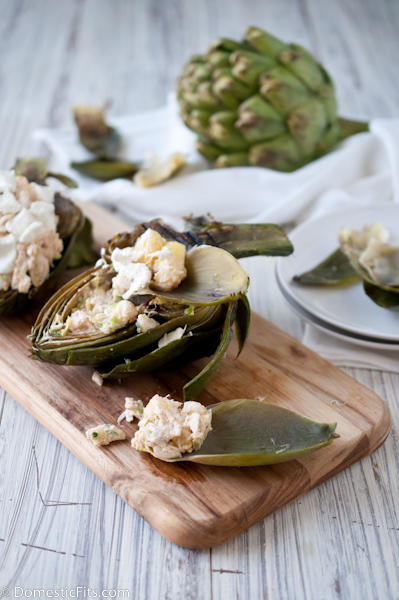 Baste artichokes with melted butter while grilling. 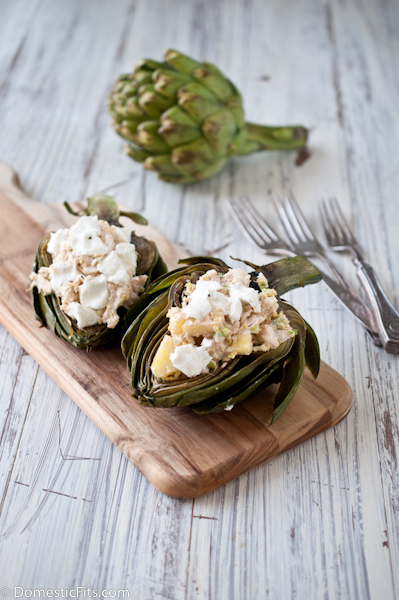 Remove from grill, fill the cavity of each artichoke with crab mixture and top with crumbled goat cheese. Return to the grill, crab side up, and cook just until the filling is warm and the cheese has started to melt, about 3 minutes. A year without a grill in Cali! Ugh. These artichokes look amazing! 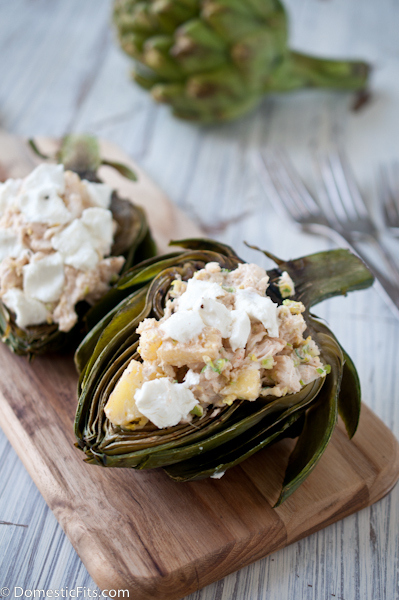 I love the crab filling and the pineapple in them! So good! We grill a lot and I can just imagine how hard would it be to be without a grill for so long. Loving these artichokes! And the crab filling – yum! Since I live in an apartment, I crave a grill in the summer like water. It makes food so much tastier! I could eat this filling alone, crab and pineapple, yummy! This looks awesome! I love artichokes, and crab filling?? Yes please! Oh goodness – I think I need to invest in a grill stat! This looks amazing. Making it! No grill in Cali would be like not having a winter coat in Denver! Oh my! And can I tell you, these artichokes are amazeballs. I love, love the crab addition! What a great idea for the grill, this looks so wonderful! Looks like the perfect summery dish!